Stuck on whether to start a blog? Are you stalling to find topics to write about? Blogging is not easy and takes a bit of work. But blogging can be less difficult than you think. Look all around you. In the news media, professional bloggers report it. In the business world, company bloggers sell it. 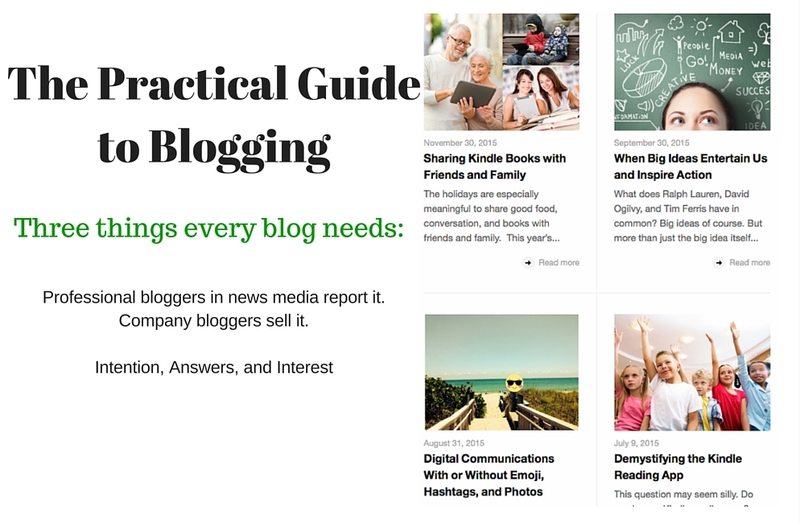 Discover the same three elements that are vital for your blog. Your intention can be as big and beautiful as your mind. Social technologies like blogging have an immediacy for you to share what you know for the greater good. See this example: Are People Better Off with Social Technologies? There is an answer to every burning question. Do a little digging. And think of your readers. What are the answers your readers are looking for? Your intention and interests will light the way to greater insight. For example, can you share Kindle Books? When more than one or two people were asking this question, you can bet many others have the same one. This answer became the blog post: Sharing Kindle Books with Friends and Family. This idea for a question and answer blog post came after reading Guy Kawaski’s book Enchantment: Are You an Eater or a Baker? Follow your curiosity to find interesting topics for your blog. To hire Ann for blogging assistance, including planning, tool selection, and content development, please email ann@annmaugustine.com. And see more ideas for your blog on the Blog!